Magick Powders are dried herbs which have been ground up super- fine. They are sprinkled to release their power. In a mortar and pestle grind together the dried herbs. Be sure to keep your magick goal firmly in your mind. If you skip this step the magick powder will not be programmed and the magick will be lost. Pour the herbs in a mason jar with lid, and then add a drop of two of essential oil. You may or may not decide to add essential oils to the recipe, but if you do, only use a drop or two, else you will make your powder sticky. I like to add them because I love scent and I find that the oils add an extra bit of power to the powder. If you wish, you may also add extra–fine glitter or colored sand to the mixture. I like to add glitter because the sparkle seems to bring the mixture to life and gives it a visual punch. Put the lid on the Mason jar and shake vigorously. Again, be sure to concentrate on the magickal purpose of your powder. Once everything is thoroughly mixed together, pour into a clean glass bottle, cap and label. To use your magick powder, hold a pinch in your hand and envision the outcome that you desire, once you “feel” your powder is filled with energy, you may burn it, release it to the winds, sprinkle it on the earth, or throw it into running water. For candle magick, rub your spell or ritual candle with oil then roll it in the magick powder. Sprinkle around the perimeter of your magick circle before ritual or spell casting. 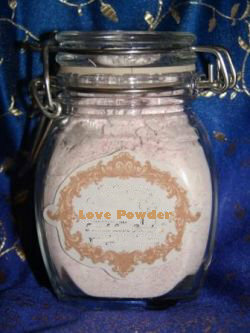 Sprinkle on your Altar or draw runes or other magickal sigils with the powder to add extra power to your magick spells. Sprinkle in specific shapes to use as focal points for visualization: protection powder in shells or pentagrams; love powder in hearts; psychic powders in spirals. Hold the powder in your hands, feel its energies and visualize your wish with perfect clarity. Summon the power within you and send it into the powder. When it is alive with energy, fling it as far from you as you can. As the powder touches the Earth, it releases its energy and guides your wish into manifestation. Sprinkle under your pillow before you sleep. Sprinkle on and around your divination tools. Sprinkle on your Altar or in a circle around you, before you begin divination. Sprinkle wherever you need protection and strong purification. Herbs - Lavender, Catnip, Jasmine and Hyacinth. Hold the powder in your hand or sprinkle in a circle around you. Visualize yourself filling with joy. Sprinkle in the garden, home, farmyard, or wherever fertility is required. Sprinkle on or around a bed or room where a person is in need of good health. Sprinkle on or around the person or animal that requires healing. Sprinkle wherever you need to break a hex. Sprinkle some in your pocket, car or outdoor space. You won’t become invisible, but you will be able to pass unnoticed if you are stealthy. For use in attracting love. Be sure to sprinkle the bed sheets or bedroom. Sprinkle yourself before going out to help you meet someone new. Sprinkle in your place of business, in your wallet or purse. Rub onto money before spending. Or, sprinkle in a dollar sign on your altar or place of meditation and burn green candles over the powder symbol. Use to attract wealth in all its forms. Sprinkle around the outside of your home and the borders of your property to ward off baneful energy. To protect yourself, sprinkle in a circle and stand within it until feel safe and protected. Sprinkle before meditation, or before you undertake any psychic work. Sprinkle on yourself, your altar, ritual tools, sacred space - on anything that needs purification. While you are outdoors hold the powder in your hand, circle three times deosil then blow the powder into the wind. Use on your Samhain Altar, ritual tools and candles. Sprinkle some powder around pictures of your deceased loved ones. Sprinkle before meditation or rituals to turn your awareness to higher things. Sprinkle wherever you require success. Sprinkle on books, manuscripts, sprinkle in your pockets before going to classes.